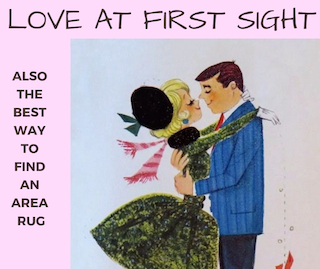 The best way to choose an area rug is to find one you're in love with and take it home. If only it were that simple. Searching for love is hard. It takes commitment. It takes time and effort. Some people aren't looking for love, they're just looking for something pretty and fashionable that coordinates with the rest of the space. That makes the selection process much simpler and less time consuming. If that sounds like you, it’s a good idea to have paint and fabric swatches to take along with you whenever you're out shopping for home furnishings. You never know when you're going to find the rug that speaks to you. Colorations for area rugs truly run the gamut. There are rich palettes of reds and golds, antique-washed greens and browns and subtler azures and weathered grays. Again, be sure to take along a swatch of the upholstery or drapery you'd like to match. Often the interior lighting of a showroom will differ greatly from the lighting in your own home, so it helps to see how your upholstery fabric will match up under different lighting conditions. Several companies allow you to take rugs home, they might even let you "try a few on" before making a purchase. One of the advantages of area rugs are their design flexibility. Whether seasonal changes, dressing up for the holidays or simply to add a bright spot of color, area rugs give you an opportunity to go bold and try on new looks -- and best of all, change it out once you're tired of it. Don't be afraid to use bright colors to liven up any space. Just as there are endless choices in color, patterns are equally as plentiful. The traditional Aubussons (a classic French floral design) and Kirmans (finely detailed Persian geometrics) have given way to more contemporary looks in bold shapes. The pattern you select will depend upon your personal inclination, but keep in mind that "matchy-matchy" furnishings are a thing of the past. Eclecticism reigns in today's design culture, giving you more leeway. Go ahead, be bold. Today’s machine-made area rugs are so well made in terms of design and construction, and so affordable, that you can’t go wrong. Smaller pattern repeats (also called an all-over design) can create the look and feel of wall-to-wall carpeting. Rugs featuring larger patterns or patterns with a strong center medallion or border give a more dramatic effect. 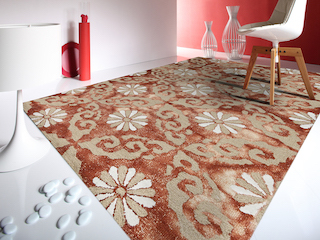 These rugs often feature a border, which is the design that frames a rug's field (the central part of the rug). Buying a rug is no simple process. Most flooring stores don't carry a wide selection because they take up a lot of space; at the same time, they those that od carry them often offer a selection of better quality machine made rugs that are affordable and stylish. Home centers carry rugs too, but they're often at the lower end of the price and quality spectrum. Mass merchants like WalMart and Target have rugs, but again, they tend to be at the lower end. Furniture stores do carry area rugs, but most have a limited selection. Places like Pier 1 and Home Goods have a nice, albeit limited offering. 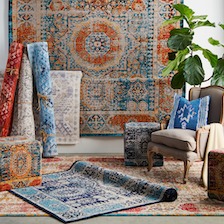 High-end rugs are almost always sold through dedicated showrooms. 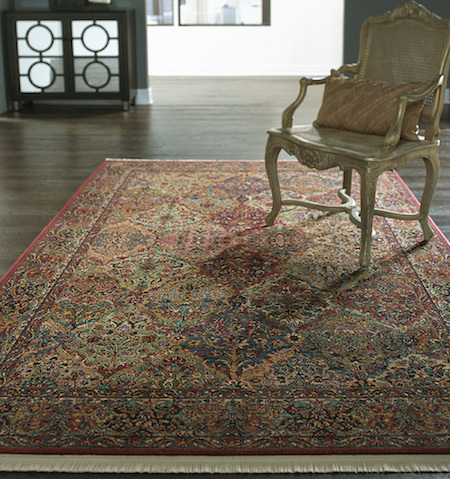 Here you can expect to see workers flip rug after rug until you find one that you like and is in your price range. The are often the most expensive, highest quality rugs because they're dedicated gated to rugs. The widest selection you'll find will be online but that means sorting through web page after web page before you find the right one. And be careful, the colors you see on your screen don't always reflect that actual colors of the rug. Find the place that feels right to you and go take a look. Perhaps the easiest way to find the right rug is to create your own. Several carpet mills have programs specifically designed to make it easy for you to select a broadloom carpet and create your own custom rug. Some other mills also offer customization programs but they can get pricey.